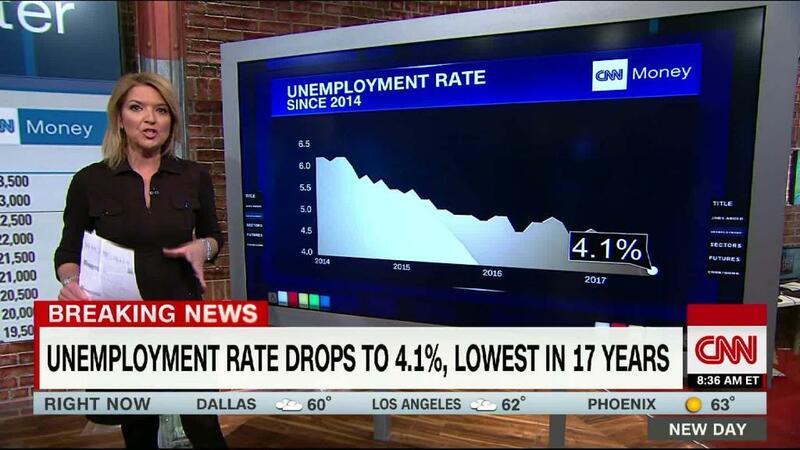 Americans see jobs aplenty. Good wages? Not so much. If you ask most Americans, finding work isn't that difficult these days. But getting paid enough to get by still remains a problem. 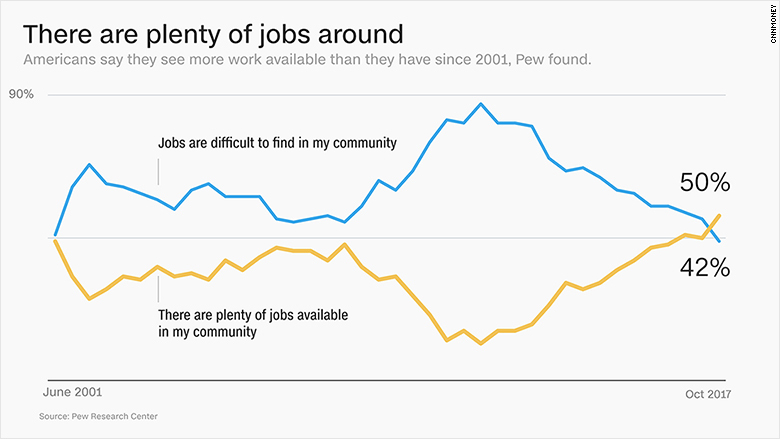 The percentage of residents who think jobs in their area are plentiful spiked to 50% last month, the highest reading since the Pew Research Center began asking the question 16 years ago. In October, the unemployment rate also reached its lowest rate since 2001, and the number of people working part-time because they can't find full-time jobs is back to its pre-recession level. However, landing a job doesn't necessarily mean paying all the bills. 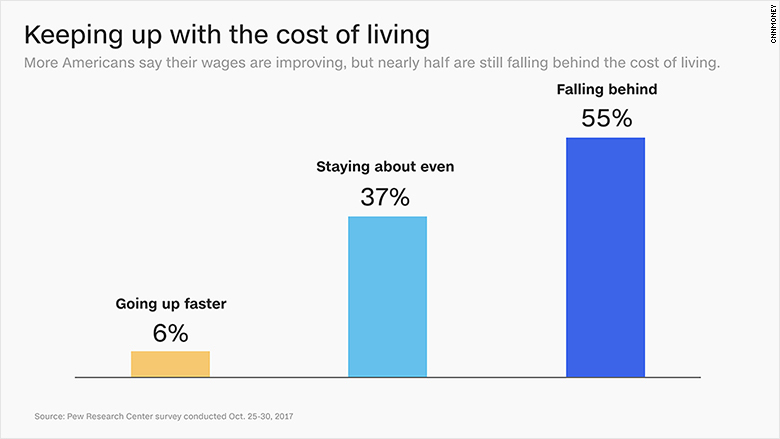 Nearly half (49%) of Americans still feel their wages haven't kept up with the cost of living, Pew's survey found. That percentage has declined in recent years, but still reflects lingering insecurity. Many families say they have little cushion against income shocks, like a job loss or a health scare, and retirement savings are getting thinner from generation to generation. That sentiment tracks with official statistics. Although median wages have risen faster than inflation over the past year, people in especially high-cost cities, like Denver or Seattle, or those living where there are sluggish job markets are still unable to keep up. For these folks, paychecks still haven't grown enough to make up for decades of stagnation. Despite their correlation with real-world conditions, however, the respondents' opinions may also be impacted by political factors. The eight-point jump in positivity towards the job market since February was driven mostly by Republicans. Over the course of that time, President Trump has gone from lamenting the weaknesses of the economy to trumpeting its strengths. Opinions are also stratified by income. Those who make more than $75,000 a year believe that jobs are plentiful by a 20-point margin over those making between $30,000 and $75,000. High-income people are also significantly more likely to think that Trump has made the economy better -- 37% of this group believe that, compared to 19% of respondents making less than $30,000. At approximately the same point in President Obama's first term, slightly more people believed his policies had made economic conditions worse — 20% to Trump's 18%. But that was also in the depths of a recession, rather than during a years' long streak of job growth and stock market gains that the current White House inherited.